Our review today is of one of Nutriment’s products called Cebrexis. 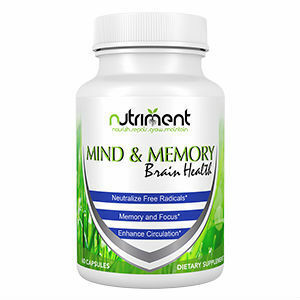 This product is said to be able to maintain a normal blood flow to the brain, thus improving memory, motivation and cognition. The manufacturer also advertises it as a great solution for anxiety and even fatigue as it neutralizes free radicals. You should keep on reading to find out more about this product and whether or not we think it is a suitable treatment choice. The active ingredient in this remedy is Ginkgo Biloba extract which has been standardized to contain the optimal concentration of flavoneglycosides (24%) as well as terpene lactose (6%). This compound is used to improve circulation as well as focus and overall memory. The capsules are made with gelatin, which makes them unsuitable for people who keep a vegan or vegetarian diet. Other than that, all the ingredients are 100% natural, therefore safe to use. This product is exclusively designed for adults over 18 who should take it as a dietary supplement twice a day. For optimal results the remedy should be taken with food and with at least an hour before administering other prescription drugs. Like we said before, this supplement is only supposed to be taken by adults. Pregnant and nursing women should consult their physician before beginning this course of treatment. The label also advises against taking the capsules if the customer is about to undergo surgery in the near future. One month supply of this supplement (a bottle with 60 capsules) costs $19.95. Unfortunately, the manufacturer does not offer any other discounts or multi – bottles packages. The product’s official website also doesn’t mention anything about shipment fees or monthly subscriptions. Be that as it may, this still remains quite an affordable product, especially when compared to other similar ones. Another weak point of this supplement is the lack of a guarantee. Of course, this raises some serious questions when it comes to the effectiveness of this treatment. Apart from the no guarantee policy and no information whatsoever regarding refunds or returns, the product also seems to be disadvantaged by the lack of customer reviews. There are actually no opinions from customers about this product. This is obviously concerning and it made us question both its popularity and its efficacy, not to mention the quality of the used ingredients. In conclusion, one of the great things about Cebrexis, manufactured by Nutriment is the fact that it is exclusively made out of natural ingredients. Given the fact that it has no added artificial ingredients we can only draw the conclusion that this supplement is safe to use. On top of that, it is also very affordable, in spite of not having any available discounts. However, if we take into account the fact that the manufacturer hasn’t bothered to gain the trust of his customers by offering some kind of a guarantee, we can only suggest you reconsider this purchase. On top of that, the product has no customer reviews, which is equally disturbing. Henry Costa	reviewed Nutriment Cebrexis	on November 16th	 and gave it a rating of 2.